The infamous Sour Mash Moonshine! Unskilled distillers fear it. Professional distillers love it. Curious distillers, well they are always curious and will definitely want to check what the fuss is all about at a given stage. 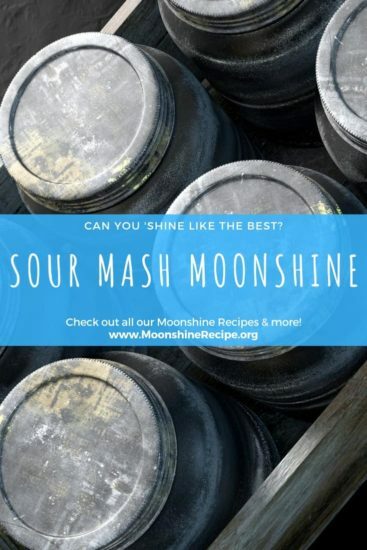 The truth is that sour mash is a very powerful technique from the professional distilling toolkit that lets you maintain virtually the same flavor and quality of the shine over numerous runs. This is achieved by keeping the original mash and adding backset to it, which lowers the pH of the mash and wards off any unwanted bacteria or wild yeast. The downside to this method, however, is that you have to keep fermenting and distilling the whole thing over and over again, keeping a precise run schedule. So it may prove to be not everyone’s cup of tea. However, if done right, you can reach professional-level quality with your moonshine by using the sour mash method. Prove your mastery of 'shining with this handy guide! Fill remainder of barrel with water. In about 21 days a red skim will appear. Push a hose with a stopper at the end to the bottom of the barrel. Next step is to siphon off mixture until approximately 4 inches are left at the bottom of the barrel. Strain the remainder of the liquid. Place in cooker and cook until it boils, then simmer. This should yield 1.5 gallons of 105 proof moon shine. Heat 5 gallons of water to 150°F in the boiling pot. Mix in 5 pounds pf cracked corn, 5 pounds of corn meal, 1 pound of table sugar and 2 pounds of malted barley and hold at 150°F for about 2 hours. Chill to room temperature, transfer to the fermenter, add yeast, close the lid, and place the airlock ensuring an airtight seal. Let ferment for 10-14 days until airlock activity stops completely for 1-2 days. Rack the wash off the yeast sediment into the still using the siphon and strainer. Do not discard the yeast sediment and grains from the fermenter, add about 3 gallons of warm water for the duration of the distilling run. Run the still hot and fast, collect all the runnings without making cuts, run down to 20 proof. Collect the remaining wash from the distiller (backset), mix in 1 pounds of sugar until completely dissolved, cool to room temperature then add to the fermenter with the diluted sediment from the previous fermentation. Add fresh yeast, close the lid, place airlock and let ferment for 10-14 days. When the fermentation is finished, transfer the wash with a siphon tube into the still. Do not dump the yeast sediment and grains, add 3 gallons of warm water and set the fermenter aside. Add the collected runnings from the previous distillation run into the still with the wash.
Run the distillation as you normally would, in this case managing all the cuts properly. Collect the backset from the still, chill it to room temperature, mix in 1 pound of sugar and add to the fermenter. Repeat steps 9 to 14 several times to generate a proper sour mash moonshine. With proper skill and grain management the sour mash cycle can be repeated almost indefinitely. It makes sense to maintain the cycle if you’re planning to distill on a regular basis with a proper schedule. 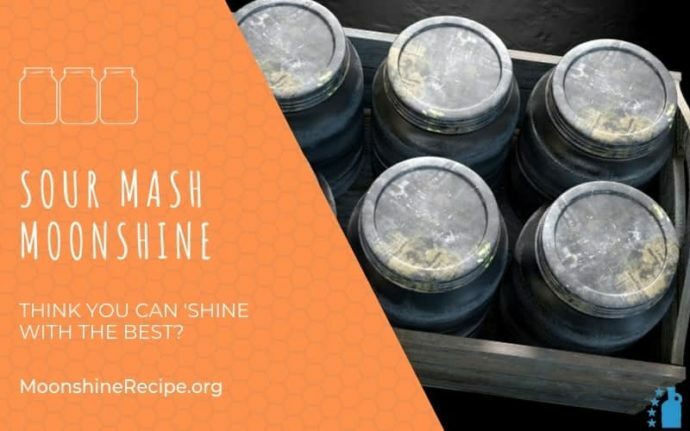 Check the smell and taste of the mash after every fermentation cycle, replace the spent grains with fresh ones or restart the cycle if you feel like the quality is not as good as in the previous run. If you’re distilling only occasionally, maintaining a sour mash cycle may prove to be too much trouble.